The M4 relief road is a proposed motorway south of the city of Newport, South Wales. Originally proposed in 1991, the scheme was dropped by the Welsh Government in 2009 when costs had risen to £1 billion. They were revived in 2011 with indications of support from the Treasury given in April 2013. There was controversial media speculation that it would be the United Kingdom's second full toll-paying motorway. In July 2014, the Welsh Transport Minister, Edwina Hart, stated that the scheme, following the so-called 'black route', would go ahead and could be completed by 2022. A second motorway has been proposed to the south of Newport, running for 14 miles (23 km) parallel to the existing M4 motorway from junction 23A at Magor, to junction 29 at Castleton, avoiding the need to widen the Brynglas Tunnels. The concept behind the motorway was based on the M6 Toll motorway, a relief road built to reduce traffic on the M6 motorway around Birmingham. 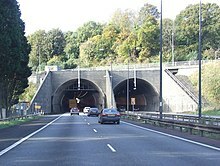 The existing motorway runs through the Brynglas Tunnels north of Newport city centre. Like many stretches of motorway, it does not conform to current motorway standards: it lacks continuous hard shoulders due to previous widening, has closely spaced junctions and narrows to a restricted two-lane section through the Brynglas Tunnels, where heavy congestion occurs at peak hours. A variable speed limit is in place between junctions 24 and 28. M4 sliproads at Junction 25 (Caerleon Road) are diverted to reduce traffic through the tunnels. M4 Westbound traffic joining at Junction 25 is diverted via Junction 25A/A4042 (Heidenheim Drive)/A4051 (Malpas Road) to Junction 26. Similarly eastbound traffic wishing to exit at Junction 25 is diverted from Junction 26 via the A4051/A4042/Junction 25A. This adds to congestion on Malpas Road and other local roads near Newport city centre at peak times. According to the Welsh Government, traffic data shows that the motorway is already approaching, and at times exceeds, capacity; forecasts show that if nothing is done these problems will only increase. An M4 relief road between Magor and Castleton was first proposed by the Welsh Office in 1991, but there was little progress on the scheme in the following years. Plans for the New M4 were announced on 3 March 2006 as part of a raft of measures to improve road transport in Wales. The road would have cost between GB£350 million and £1 billion, and been financed by a Private Finance Initiative (PFI) with the Welsh Assembly. It was planned to be the United Kingdom's second full toll-paying motorway, after the M6 Toll. Proposals in 2004 for the road to be tolled were met with scepticism. Several experts suggested that a new toll road would be "a white elephant for 20 hours a day", due to the greatly variable traffic levels through the Brynglas Tunnels. Outside peak hours, the tunnels would still have been the preferable option to taking a toll road for most people. Liberal Democrat spokesperson Jenny Randerson raised concerns about whether a toll would have been necessary on the road, as the Severn Bridge, less than 10 miles (16 km) to the east, also charges a toll to cross it and compared the plan to a "double tax on Wales". The Road Haulage Association said that an additional toll was "almost rubbing salt into the wound". On 15 July 2009, the Deputy First Minister Ieuan Wyn Jones announced that the plans for the New M4 were to be dropped and replaced by a package of measures to improve the flow of traffic on the M4 motorway in south-east Wales. In November 2009, Dr. Anthony Beresford of the Business School at Cardiff University called for the decision to cancel the road to be overturned. The River Usk at Newport Docks, close to where the new road would cross the river. The distant building with the tall chimney is Uskmouth Power Station. In December 2011, the UK Chancellor of the Exchequer, George Osborne, announced that he would discuss options for improvements to the M4 with the Welsh Government, including the provision of additional finance which, it has been reported, could lead to the re-emergence of plans for a new M4 relief road. In February 2012 work started on a dual-carriageway road connecting Newport's southern distributor road to junction 23A of the M4 using part of the proposed route of the M4 relief road and a former access road to the Llanwern steelworks. A public consultation exercise on options for improving the capacity of the M4 corridor around Newport opened on 5 March 2012. On 2 April 2013 it was reported that the Chancellor of the Exchequer George Osborne was likely to give support to the scheme in the Autumn Statement and various newspapers reporting that it would be tolled. The Welsh Government countered, saying that it had no plans for tolling. Osborne also denied any plans for tolling. A consultation on the proposed plan ran from 23 September to 16 December 2013. On 16 July 2014, Wales Transport Minister Edwina Hart said that the preferred "black route" south of Newport between Junctions 23 and 29, including a new crossing of the River Usk, would go ahead. She said that it would boost the economy, ease traffic congestion and improve road capacity. The scheme would be the largest capital investment programme in Wales since devolution. It was hoped that it would be finished by 2022. The current M4 would be diverted at Magor to follow the A4810 Eastern Distributor Road, before diverting away from it across the Caldicot and Wentloog Levels. The first junction would be located just south of the steelworks site to provide access to the Glan Llyn development site. This would be followed by a bridge over the River Usk, before another junction over the docks providing a link to the A48 Southern Distributor Road. The remainder of the route would cross the levels just south of Duffryn, before an interchange with the current M4 and A48(M) at Castleton. Friends of the Earth claimed that the road would cause great damage to local wildlife habitats as it was planned to pass through the Caldicot and Wentloog Levels, an area of natural wetlands. They also raised concerns about the large sum of public money that would have been used to fund the project, claiming that it could be better spent improving the local railway network. After the July 2014 announcement that the scheme would go ahead, Gareth Clubb of Friends of the Earth Cymru called the proposal "utterly unnecessary and terribly damaging". The Campaign Against the Levels Motorway (CALM) claimed that the proposed motorway would ruin a historic landscape and increase carbon emissions. Associated British Ports, who operate Newport Docks, said that the 2014 plans could jeopardise future investment in the area. Matthew Kennerley of ABP said: "We don't think it's a great idea to put the new route through the centre of Wales' most important general cargo port. We believe there is an alternative route...slightly further north...[which] would still have an impact on the port but to a much lesser extent because it would not be bisecting very important quayside areas." ^ "New M4". Welsh Assembly Government. Archived from the original on 10 December 2008. Retrieved 20 September 2008. ^ "CBRD M4 Toll Feature". www.cbrd.co.uk. Archived from the original on 30 September 2008. Retrieved 7 September 2013. ^ Rhodri Clark (5 December 2011). "Plans for M4 relief road back on the agenda – two years after being scrapped". Western Mail. ^ "Llanwern steelworks road relief for Newport M4 bottleneck". ^ "M4 corridor enhancement measures: Overview". Retrieved 5 March 2012. ^ "M4 relief road: Chancellor 'to approve toll plan'". BBC News. ^ a b "£1bn M4 relief road around Newport given green light". BBC News. 16 July 2014. ^ "CALM Home Page". Campaign Against the Levels Motorway. ^ "£1bn M4 relief road 'risks Newport docks jobs and trade'". BBC News. 17 July 2014. This page was last edited on 21 November 2018, at 15:57 (UTC).